It took a few hours longer than planned due to the SAN reporting some issues after restarting, but we are back up and running. From time to time we’ve had people wonder if the XML-RPC API is turned on for their Bugzilla installation. The answer is yes in all cases. 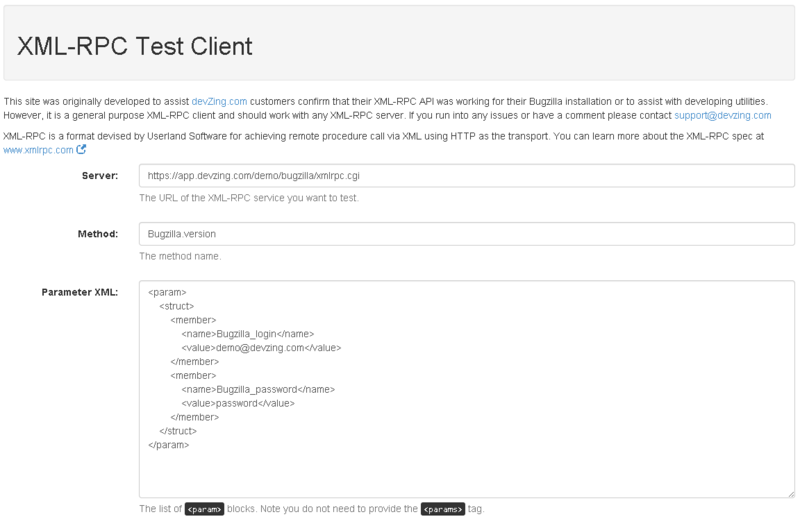 Nevertheless it is difficult to verify as Bugzilla will not give you a meaningful response if you go to https://<mybugzilla>/xmlrpc.cgi in your browser. Other clients want to verify some off error message they are getting from a tool that integrates with Bugzilla through the XML-RPC API. To solve these questions we have deployed our online XML-RPC client. By default it has the URL and credentials for our Bugzilla demo, but you can point it to any Bugzilla with XML-RPC enabled (even https://bugzilla.mozilla.org/). The tricky bit is the parameter XML. Bugzilla XML-RPC expects a single <struct> element. The names of the parameters listed in the API docs for each function are the <name> element for the struct <member>s. See Bugzilla::WebService::Server::XMLRPC and Bugzilla::WebService for more information. This is the minimum set of parameters for Bugzilla 4.4.x as almost all methods require authentication. For more information on how to represent various data types see the XML-RPC specification. We have scheduled a 6 hour downtime window on Sunday Sept 28 starting at 02:00 GMT. New redundant routers, switches and firewalls. 10Gbps Internet connectivity to multiple carriers. New redundant 8Gbps fiber channel switching fabrics (A and B side fabrics) for storage. 5 new SANs (Storage frames). The bulk of this new equipment is already installed and tested. During the downtime we will be physically moving the servers to the new cabinets and verifying the final configuration. We are doing everything possible ahead of time to ensure a smooth and trouble free upgrade. Adobe does not properly restrict the SWF file format, which allows remote attackers to conduct cross-site request forgery (CSRF) attacks against Bugzilla’s JSONP endpoint, possibly obtaining sensitive bug information, via a crafted OBJECT element with SWF content satisfying the character-set requirements of a callback API. Interestingly this bug only seems to affect Firefox users. Version 0.2.1.1 of this package has been released. This package is designed to provide an easy-to-use, typesafe interface to querying Bugzilla from Haskell. python-bugzilla 1.1.0 is a Bugzilla XMLRPC access module for python that provides a kinda pythonic interface to Bugzilla over XMLRPC. It was originally written specifically for Red Hat’s Bugzilla instance, but it is intended to work with any bugzilla instance. Welcome to Bugzilla 4.4! This new major release comes with several new features and improvements. This release contains major improvements to WebServices, which was the main target in this release, a rewritten tagging system, a real MIME type auto-detection for attachments, performance improvements and lots of other enhancements. The Bugzilla team announced the release of Bugzilla 4.2. The devZing team will be evaluating this release before scheduling upgrades for existing customers. If you are interested in upgrading right away please contact support. You can now create a new attachment simply by pasting some text into a text field, in addition to the normal upload process for attachments. By default, bugmails (email notifications about changes to bugs) are now sent in an HTML format that is more readable than the old text format. Those who prefer the old text format can still choose it in their Preferences, however. The Custom Search section in the Advanced Search page has been redesigned to work in a more sensible way. Complex queries are easier to build and have more sensible results, as they are built using a more intuitive logic. Some very complicated queries are still impossible to generate, though. Things should improve in future releases. Older components, versions and milestones can now be disabled. Bugs already using them are not affected, but these values will no longer be available for new bugs. A custom field can now be displayed based on multiple values of another field. (For example, one custom field could now appear in multiple products.) Previously, you could only display a custom field based on a single value of another field. Most changes made through the admin interface are now logged to the database, in the audit_log table. There is no UI to access this table yet. A project has started thanks to Francisco Donalisio from IBM to make Bugzilla compliant with the W3C Web Accessibility Initiative standards. A lot more work still needs to be done, but we expect a much better compatibility for the next major release. The Bugzilla team has released a security fix for Bugzilla 4.0.x. A CSRF vulnerability in the implementation of the XML-RPC API when running under mod_perl could be used to make changes to bugs or execute some admin tasks without the victim’s knowledge. This defect does not affect any devZing customers. However, all new devZing hosted Bugzilla installs will be created with Bugzilla 4.0.5. All Bugzilla hosting customers have been upgraded to Bugzilla 4.0.4. You can read more about the release at the Bugzilla site. When a user creates a new account, Bugzilla doesn’t correctly reject email addresses containing non-ASCII characters, which could be used to impersonate another user account. Such email addresses could look visually identical to other valid email addresses, and an attacker could try to confuse other users and be added to bugs he shouldn’t have access to. Due to a lack of validation of the Content-Type header when making POST requests to jsonrpc.cgi, a possible CSRF vulnerability was discovered. 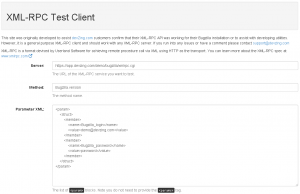 If a user visits an HTML page with some malicious JS code in it, an attacker could make changes to a remote Bugzilla installation on behalf of the victim’s account by using the JSON-RPC API. The user would have had to be already logged in to the target site for the vulnerability to work.